Slit the chiles from stem to tip and carefully remove the seeds, leaving the stems intact. Set aside while you prepare the filling. Purée the tomatoes, onion, garlic, Serrano, oregano, cumin, cinnamon, and 1/2 tsp. salt in a food processor or high-speed blender. Heat the oil in a skillet over medium heat. Add the purée and cook, stirring frequently, until the liquid has evaporated and the mixture looks thick and pulpy, 8 to 12 minutes. Remove the pan from the heat. Stir in the chicken and quinoa, and then half of the cheese, the cilantro, and the lime juice. Season to taste with salt and black pepper. 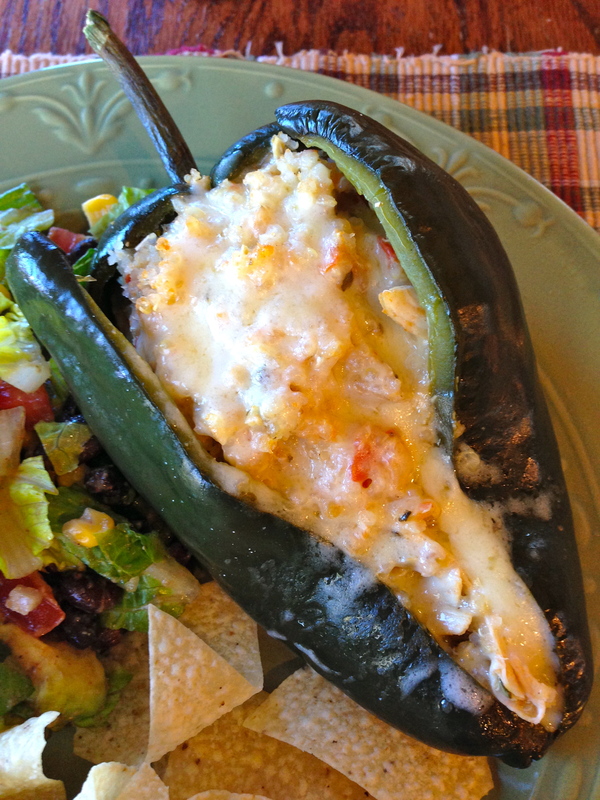 Divide the filling evenly among the peppers. Place the stuffed peppers into a 9×13 glass baking dish, pour about 1/2″ of water in the bottom of the baking dish and cover tightly with foil. Bake for 40-50 minutes or until peppers are tender. Remove the foil and top the peppers with the remaining 3 oz. of cheese…bake until golden and bubbly. 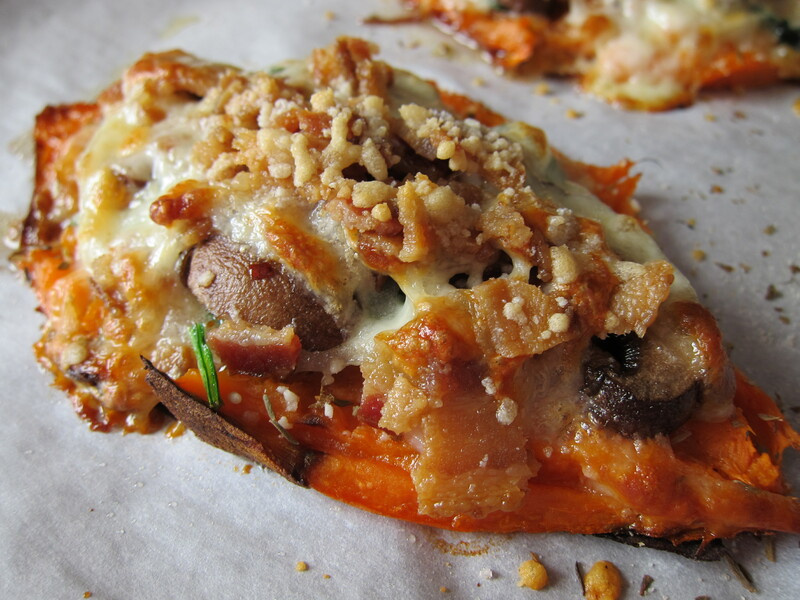 Sweet potato stuffed with bacon, onion, mushrooms and spinach. I LOVE sweet potatoes, I would probably eat them at every meal if I could. I like them baked, fried or sautéed, diced, sliced or even pureed but I am really loving them stuffed! The recipe and photo shown here is currently my favorite way to stuff them but the possibilities are endless (think any great pizza toppings and you’re set! ), you can top them with anything you like and customize them to meet your dietary needs. Preheat the oven to 400° F. Pierce each sweet potato several times with a fork. Place them on a parchment lined baking sheet and bake on the middle oven rack. Bake until the sweet potatoes are easily pierced with a knife and cooked through, about 45-60 minutes depending on size. Remove from oven and let stand until cool enough to handle. While the sweet potatoes are baking, make the topping. Fry the bacon in a large skillet until crispy. Remove from pan, cool and crumble. Add the mushroom and onion to the pan with the bacon drippings and saute until tender, add spinach and cook until wilted. Remove from heat. Slice sweet potatoes in half lengthwise to expose cooked insides, slightly press down the meat of the potato to flatten. Divide the vegetable mixture evenly between the four halves, top with cheese and crumbled bacon and place under the broiler until melted. Finally, sprinkle with Parmesan cheese. Serve half a stuffed potato as a side dish or a whole one with a mixed green salad as a meal.